A Game of Thrones Greyjoy Shield Pin. 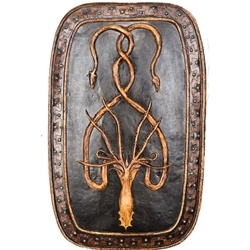 This wearable replica of the battle-tested shield of the House of Greyjoy features the exotic squid emblem underscoring mariner’s life, and illustrates their motto: “We Do Not Sow”. Produced from the actual prop seen in the series, this high-quality piece measures approximately 2.5” high and 1.6” across, made from zinc alloy with an antique finish.